DETAILS: Coastal elegance meets modern construction in this stunning Seagrove home. 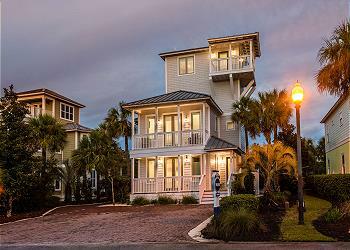 "Sea La Vie" is just steps from the sugar white sand beach and conveniently located between Seaside and Watersound. This newly constructed home has 4 beautiful bedrooms, 4.5 bathrooms, a private pool, and wonderful accommodations for 12 guests! Clean lines, modern finishes, large windows, and neutral interiors create a welcoming and refreshing ambiance in the home’s main level. The spacious, open floorplan provides ample space for guests to mingle and enjoy their time together in this stunning home. Top-of-the-line stainless steel appliances, large quartz countertops, and bright white custom cabinetry make the chef’s kitchen a dream for home cooks. A spacious dining table nearby and the large breakfast bar provide ample guest seating for meals, and the luxurious living area beckons guests to sink down on the large queen sleeper sofa and relax in front of the flat-screen television. Also on the first floor, a guestroom features a king bed and private bathroom with a glass-front shower. On the second floor are two perfectly appointed guestrooms and the luxurious master suite, which offers a beautiful king bed, a private balcony, and a private en suite bathroom with a shower and a dual-sink vanity. French doors lead to the home’s spacious second-floor balcony, which overlooks the outdoor oasis. The second king bed guestroom offers a private bathroom with a shower/tub combo. Two sets of built-in twin-over-twin bunk beds and a private bathroom with a shower/tub combo makes the bunk room a perfect place for kids! This area also boasts a spacious area to play and a mounted flat-screen television. A sparkling private pool creates the perfect place to splash and enjoy the warm Florida sunshine. This exquisite home is perfectly located just 400 steps from the sugar white sand beach and close to beautiful Eastern Lake. Four custom 360 Blue beachcruiser bikes and a six-seater golf cart invite guests to explore all that our 30A coastal towns have to offer. 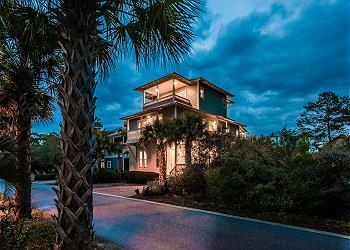 Ready to experience 30A luxury? 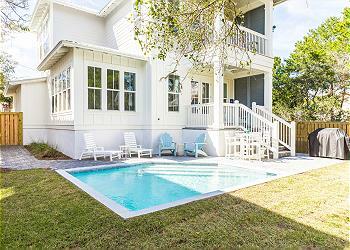 Contact 360 Blue today to book your stay at 28 Dalton Drive in beautiful Seagrove! Outstanding quarters with ample room for three for families with children. Property was immaculate inside and out, and perfectly suited for our spring break family reunion! Highly recommend, and will definitely book through 360 blue again!